The ones on the right are made of real stones. You can go really fancy and use Swarovski crystals or semi-precious stones. They’re so simple but impactful and also make great gifts! My sister bought a bunch of sock yarns. I didn’t buy any yarn this time but I’ll likely be going back soon to get some yarn for a project that I’m still looking for an appropriate pattern. Love the beads that you said were your faves! SO pretty. I love the faceting. I used to do a bit of beading, too, but was too lazy to trek out to Michaels/etc., so I tended to order from ArtBeads.com (Swarovski, yeaaaaa) or Etsy. Started to get out of hand so I haven’t for a few yrs now. I love artbeads! But sometimes it takes FORever to get the orders. Michaels at 50% is around the same price as on artbeads. You’ll be pleased to know that now there’s a Michaels on the subway line! 😀 It’s so handy. I do have to check out Michael’s! It’s like, Yonge/Eg or something, right? I need some organizing stuff like boxes and junk. I should probably try to pick up crocheting again. It seemed easier than knitting! Oh shoot, I totally forgot there’s a Michael’s there, now! Okey doke, gotta check it out 😀 Thanks! And, I’m not so sure I’m as talented as 7-yr old you. LOL! Oooh, I’m loving these! The blue/green ones are so pretty. Michaels is the best. It’s like Sephora but for crafts haha. I don’t make jewelry, but I started scrapbooking our “adventures” when my boyfriend and I started dating…have spent WAY too much money on scrapbooking supplies at Michaels in the last few years! I never got into scrapbooking but I bet I’d spend lots of money on all the fancy papers and punches and whatnot! I did dabble in rubber stamps for card making before. YES! Michaels IS the Sephora of crafts!!! Oh, you know you can never own enough fancy paper, or beads, or yarn…haha, hobbies requiring stuff from Michaels can get expensive! Have you tried making earring with gold hooks? My mom is allergic to the nickle that’s in most earrings but if her post is gold she doesn’t have any issues. Yay! Making your own jewelry is so awesome. You can make what you want depending on your mood/style at the time! Oh yes, and it’s relaxing. And after you make the stuff, you can wear what you made! I have a *quite possibly* Swarovski crystal bead necklace that I really should re-string as it snapped ages ago and I just recently found the bag of beads again. I love the bracelet idea though. It’s a good rainy day activity! I also like to bead and listen to music or have a movie playing in the background. 🙂 You’ll feel so accomplished after you re-string your necklace! I was at Michael’s two weeks ago and bought some knitting yarn and halloween crafts. The bead bracelets look so charming. I want to go back and check out more things there. I honestly don’t have a huge stash of yarn – I tend to buy for specific projects. 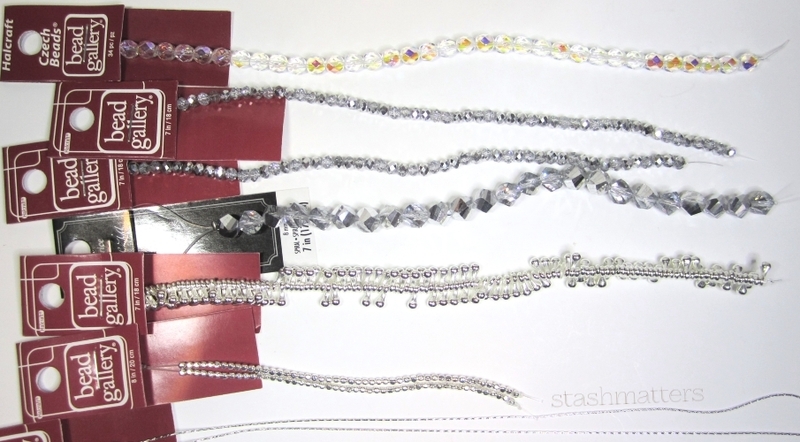 Beads and jewellery supplies – eh, a little bit of hoarding but not terrible. I do usually end up using everything I buy. Those blue / green beads for instance, is slated to be made into bracelets for presents. Those blue and brown beads are gorgeous! I’m the worst with crafts, I have a terrible habit of buying all the necessary things to start a specific craft but then I get distracted half way through and never finish. It’s a problem. I would totally buy your bracelet stacks though! That’s really pretty! I had a monthly jewellery making subscription box a while back and it got to the point I wouldn’t even open the packages because I was only excited at the prospect of making the items, but not following through. I still have 3 unopened I think lol! I think that’s exactly how I would be too. I also can’t really be trusted in craft stores because I love all the pretty things and am wont to buy them and then leave them lying around unused when I get tired of looking at them. How is the downtown Michaels? The downtown Michaels is great! They retained the 3 levels that Chapters had so the bottom floor is for fine art and framing, the 2nd level is beads / yarn / crafty, and the 3rd floor for more seasonal / decor stuff. We could have spent hours here! Michaels is a dangerous place – I go in there and I want to make all the things! Then I spend a fortune, bring everything home and it all collects dust in the corner. Haha.